Hello I hope the weather hasn't been as awful everywhere as it has here, I thought it was meant to be summer but I am mistaken! 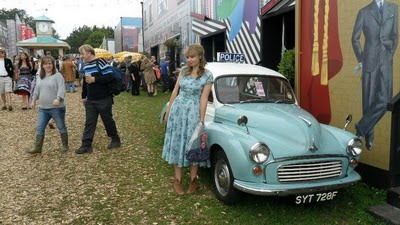 On Saturday I went to Vintage at goodwood which is a new summer festival. Now I had heard from people that went on the Friday that it was meant to be good but it was their first year so I had doubts. When you arrive you walk down through a forest lit by fairy lights which were hung in the trees then you arrive at the main entrance where you walk down a red carpet (Where may I add I was asked for my picture twice haha) Once inside there has been a whole movie set style vintage street built which is very impressive. Unfortunately I was stupid enough to not take a picture of it but I will let you imagine it in your head. I spent the morning browsing through the vintage market placed which housed over a hundred different stalls and eating waffles. In the afternoon it decided to rain but me and fern soldiered on and went for a look around the fair ground and the roller disco, then I got my make up done. About five we started queuing to see Brix Smith (the American one off gok wan)and George Lamb's (we all know George) catwalk show showcasing their lives through their clothes. I took alot more pictures but only put my favourite outfit in this post. George was looking particularly dashing in a tweed jacket, hunters and ray bans might I add haha. We then ended the day by watching the noisettes set on the main stage which was really good. I'll show you what I bought in another post as this is already far longer than my usual ones and is a picture overload! p.s. my boots are from schuh and one of my favourite items I own!